Azureus is a BitTorrent client which provides a bittorrent protocol implementation using Java language. Azureus offers multiple torrent downloads, queuing/priority systems (on torrents and files), start/stop seeding options and instant access to numerous pieces of information about your torrents. Azureus now features an embedded tracker easily set up and ready to use. It supports numerous languages, including, for instance, English, German, Italian, Japanese and French. For more information on Azureus please read our guide to Azureus BitTorrent client. Too geeky. Either I was hopelessly lost or the prog merely functioned like a search engine, giving me the same sort of returns as tax evader Google would. Dont have the time for it. This was decent software until they started asking to donate them money nearly every second time i open the software. client isn't even that much better than others. <br/> <br/>+ additional add ons <br/>+ can run in any os that supports java. <br/> <br/>-adds. what ever you want to call them (trailers etc) they are still adds. <br/>- power hungry. If my qx9650 prosessor cannot stop 99 files of 100 to not download without software going "not responding" over 10s i would say it is not very well coded. This is just one example and one of the worst cases. <br/>- when watching adds (trailers) it disables aero in vista which makes it useless to watch trailers with. <br/> <br/> <br/>There is many other torrent clients that are way better than this one. i mainly ran this software because of add ons. Begging money (on startup) is just annoying if your client is so many ways inferior to others. i would advice vuze users to try other clients like utorrent and bitcomet and choose the best. This is bloat ware. Just use uTorrent, it does whats needed without all the crap. Utorrent 1.6.X is all you need, nothing handles nats better! <br/> <br/>Everything else is either bloated or under developed! If you're a power user than Azureus is for you. It's highly customizable and you can set it to automatically start in advanced mode totally bypassing all the Vuze stuff. I like it because you can set it up exactly how you want, but there is a high learning curve. i found this program to be unimpressive. i selected a file to not download in a torrent which shows up as an error for missing data. i have gone back to utorrent now and am enjoying it. I have gone back to 2.5, lately without fail, this program is causing my machine to freeze. 2.5 feels faster and hasn't had any stability issues. May be a good program, but too many features that I don't use. Utorrent has been fine for me. I must agree with everyone else here. The newer Azureus client is very heavy on resources and contains to much rubbish that the average torrent user will not touch. However, on the torrent end of things it performs very will, always getting fast speeds. So for that I give it 4/5. Not the best, but not bad either. Ive changed to uTorrent (rather than roll back to old versions of Azureus) to keep PC performance up while downloading & seeding. <br/> <br/>Dave! The newer version is loud and vulgar in appearance. It's loaded with junk that has nothing to do with torrent sharing. Like the first poster, I've gone back to version 2.5. My rating of average reflects only the newer version, the older version still rocks. Too many bugs. No longer sees my forwared UDP port. All the new fluff is ridiculous. A simple bit torrent client like the older versions was just fine. I uninstalled it and went back to ver. 2.5. Everything works again. I used to love this software but now it dosent work with daemon tools. Also it eats memory. I'd have to say im impressed with this program, its much better than everything else i've tried. Simple-easy to understand interface, and has tons of details on the downloads. Allows many customizations, change dl/ul speeds. The only problem i've had is it sometimes will crash due to my dual core processor. I definitely recommend it to anyone looking for a good bittorrent client. Very good BitClient software. Although it took a lot of memory, but it only one client that possesses a lot of plug-in that made me enjoying adapted. I ran this 3.0.16a of Azureus with 2 Gigabyte of memory without any doubt. <br/> <br/>Thanks Azureus Team, You got 5 points. Nice software, a change-log might be nice though. Undoubtedly the best Torrent Client there is. This update worked without a hitch. Fast and reliable downloads using minimum system resource. Extremely customizable. Lots of plugins too - enables you to view the country locations of download sources (with country flags), even in 3D, together with a world map of sources. Only thing is it doesn't have a search option to find Torrents but you can use Bitcomet or another client for that. This program is great, It was easy to setup and easy to configure. It may be fusterating for all those noobies out there who just don't know how to use it. I have something to say to them. Learn to do research and read before installation. Other than that this program is the best. It has no comparison towards any other client by it self. Its all about v2.2.0.2 I think thats the last verion they released without a governer, so its not a cpu and memory hog. Fast and easy to use. Had a little problem to fix the high speed download. Alot of users experienced problems when switching to this version, but I have had none to speak of. The best BT client out there! Very stable and very informative. Magnificent piece of software. Especially with all the plugin (eg. the RSS feed plugin) it's irreplaceable. Azureus has the best multi-torrent GUI, the most features, the best speeds and the best performance behind a NAT Firewall (BitComet is nothing but a leech client and it's so called NAT Traversal blows, I've done speed tests with Azureus, BitComet and Bit Tornado and Azureus blew the other two away). The only bad thing about Azureus is Java. Azureus itself uses very little cpu and ram. It's the javaw.exe which Azureus needs to run which uses the most system resources. If you are having high cpu troubles then make sure you are using the latest Java Run Time Environment from <a href="http://java.sun.com" class="korostus" target="_blank">http://java.sun.com</a> It should be version 1.5 update 2. I run Azureus on an AMD K6-2 550 cpu with 512mb RAM running WinXP and the main resource problems I have with Azureus is javaw.exe 's RAM usage. BitComet is great if you are a leech or like getting banned from as many trackers as possible. Azureus once got banned from trackers too but the developer fixed it ages ago, probably because it's open-source and things get fixed alot quicker if there is a decent number of devs or someone who isn't even a dev. can send in a fix because anyone can download the source code. only a small thing, but the Client is running just fine on it"
"woo! my K6 266 only have 32M memory(still in use ^_^), yours has such a large memory." So not only does he have the hardware with the problem, but he can now reproduce the problem himself, see what's causing it and fix it. No wonder the leech bug hasn't been fixed. Awesome software. Very stable, with good feature mix. If, like the previous reviewer you are clue-challenged, then this is not the software for you. But then that raises the question: why in the world do you have a computer? Put it back in the box and return it to the store. Azureus is no more challenging to learn than any other piece of software that you've never used before. There is only one drawback, if you can call it that: it doesn't function well on pre-P4 machines. But again, why are you using an old computer and expecting new software to function wellently?? Azureus is a very solid client, and has much better configurability than most other clents withou using "peer_share" by default, wich helps it keep private trackers "leecher free". 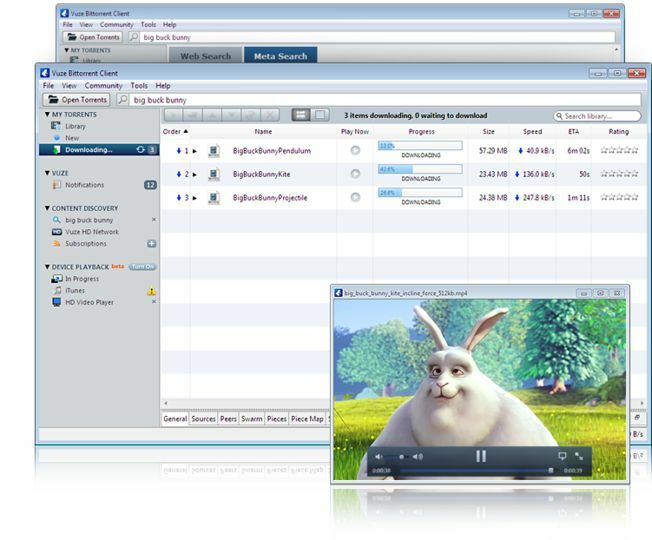 It is a little heavier than most to use, however, if you are using a broad pipe, this client has the best balance management system for multi-torrenting. If you regularly download and upload many files simulteneously, this one is a must. This said, you should tweak the disk caching function to enhance performance, or you might suffer a bit from slow disk access. No client is perfect, but this one gets my "5 star". This program slows my Computer very much. I have used 4 clients and figured out that Azureus is the most heavy for my PC. It uses a lot of CPU power and a lot of memory. Having used three different Bit-torrent clients, I have concluded that Azureus is the worst of the bit-torrent clients. I have used ABC, Azureus, and Bit-Comet. For user-friendliness, Azureus is better than ABC but not Bit-Comet. For this reason, I actually preferred using Azureus rather than ABC, only because my computer is powerful enough! When I am downloading something big on Azureus lasting a couple of days, I noticed that my computer is running slower than usual. I attempted to shut down some background programs to speed up my computer but that didn't help. So I control-alt-deleted to bring up the Task Manager and clicked on the processes tab to see what is eating up my CPU. I was surprised to find out that Azureus and JAVA are taking up a total of 87%-97% of my CPU. Mem usage, needless to say, was high, 118672K high!!! Having ABC still in my system, I compared the two. First, I cleared the RAM with Tweak XP, restarted the computer, and started ABC and downloaded something huge. After a couple of days, I checked on ABC, still downloading. The CPU is 0% and Mem Usage is 52133K. Because of how much I hate ABC for its lack of options, I decided to go back to Azureus. I just shut it down whenever I play games or watch DVD movies. Bit-Comet totally blew both of the competition away. Please read my review for Bit-Comet for more information. Final thoughts: Azureus ranks high on Geek-options, very user-friendly. But it takes quite a bite off the system. This is one of the best bittorrent clients. You have to install Java and have it running. ignore my vote. i dont know if this is a good program i downloaded it from there site and it wont even load when i try to load it.